We walked this in May 2004. After leaving the car at the car park at the mountain railway we set off up onto the Sronan Aonaich ridge. If I was going to Cairngorm now I'd try use the bus service as it runs every hour from Aviemore until 16.40. This doesn't leave much spare time but if you set off early enough it should be possible. 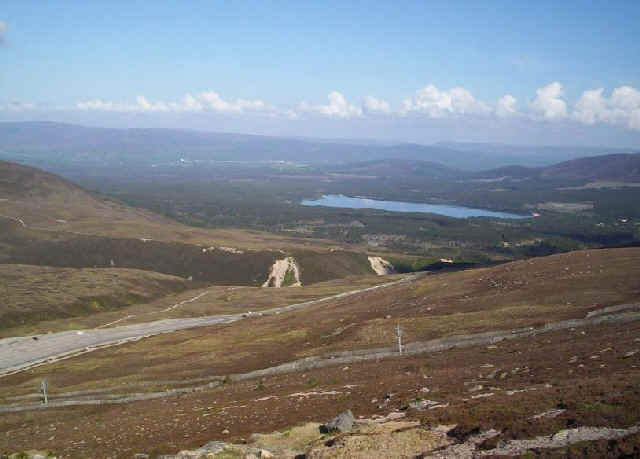 Looking over Loch Morlich from just above the mountain railway station. 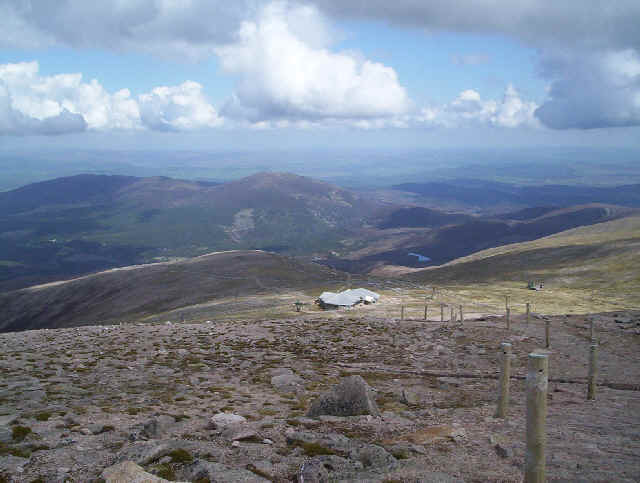 On the path up the ridge to the railway top station on Cairngorm - you can see the station on the left hand side skyline. 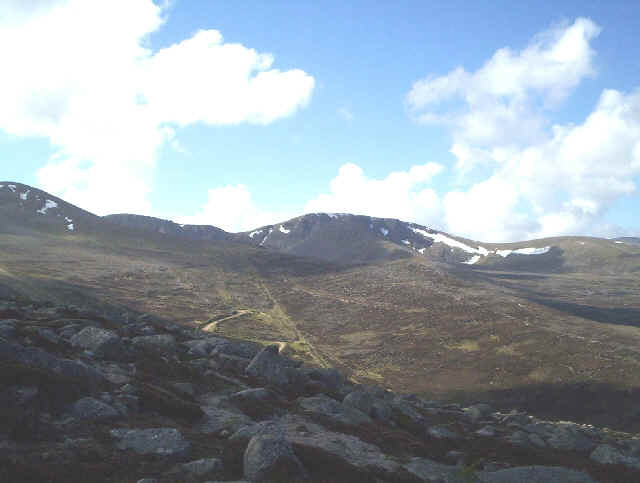 The path on the final climb to Cairngorm with the top station of the railway below. 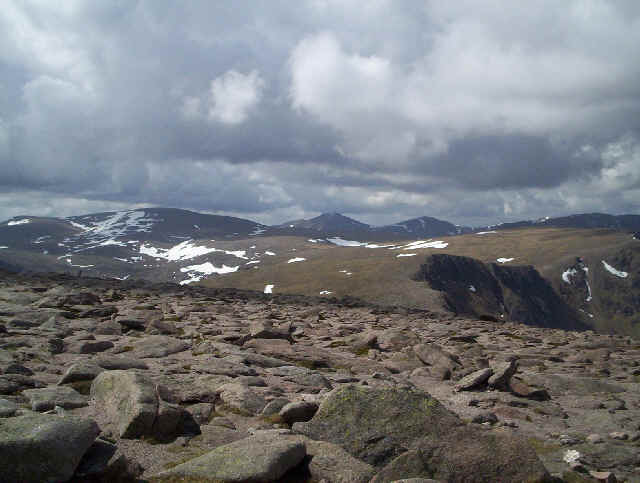 Looking from the summit of Cairngorm with, on the sky line from left to right; Ben Macdui, Cairn Toul and Braeriach. 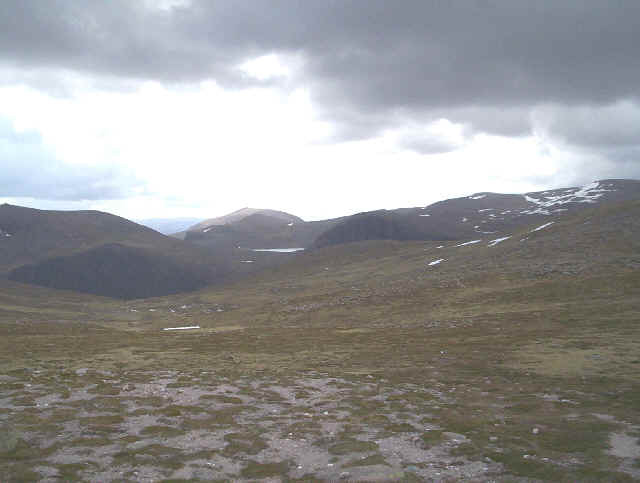 A bit further on now; there's Ben Macdui to the left of Stob Coire an t-Sneachda. Just beyond the cliffs of Stob Coire an t-Sneachda the path drops down to a bealach before climbing up to Cairn Lochan. 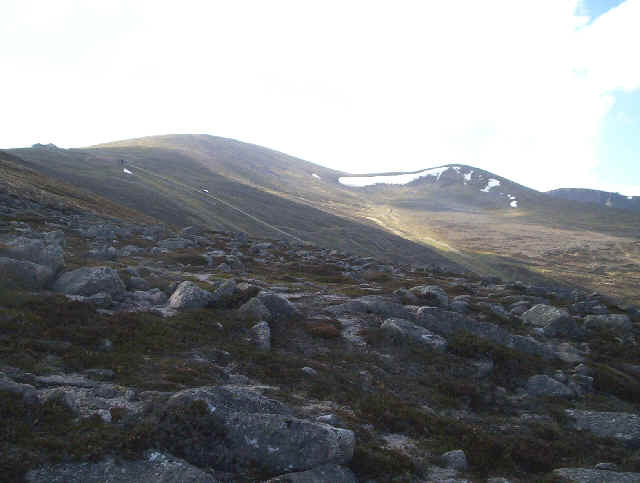 We turned off to south-west here on a track that crosses the plateau towards Ben Macdui. 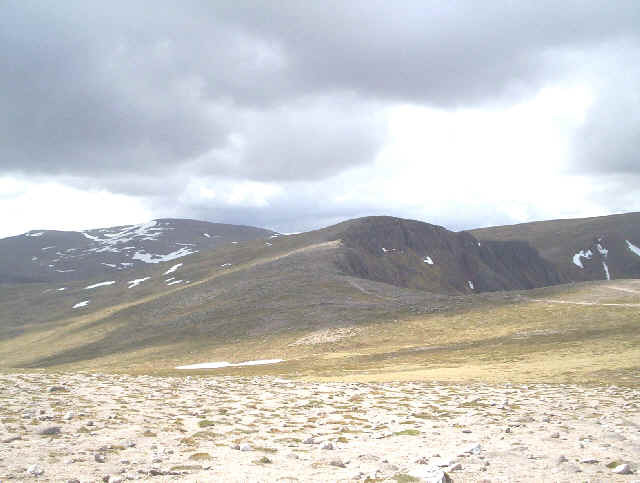 We're crossing the desolate plateau on our way to Ben Macdui, seen on the extreme right. The cliffs on the left drop down to Loch Avon. In the distance is Derry Cairngorm. 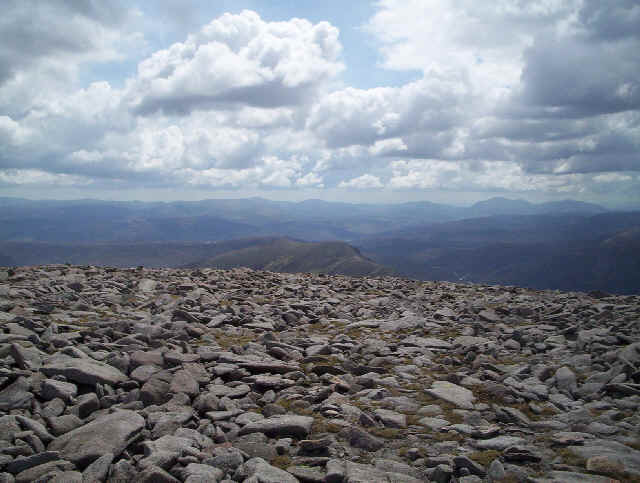 The view south from Ben Macdui's stony summit. Unfortunately, my camera batteries were now exhausted so I wasn't able to take further photos of our walk back, showing the spectacular view across the LairigGhru. Neither was I able to take photos of a herd of young reindeer that we encountered. 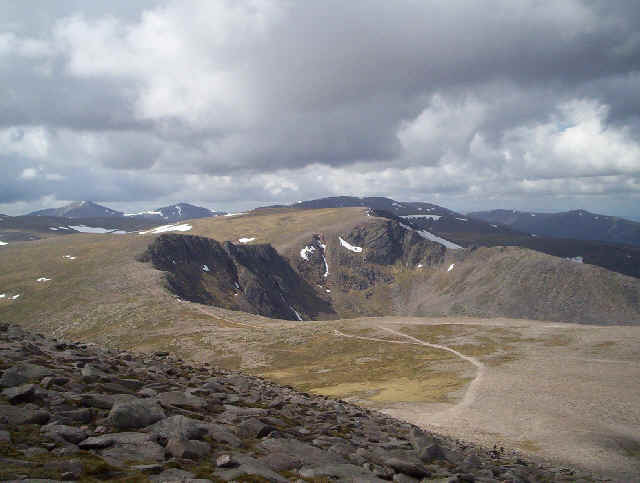 We headed along the path from ben Macdui NNW passing Cairn Lochan to the east and then headed down into Coire an Lochain to the car park. My memory tells me we started about ten o'clock and finished about half past five. 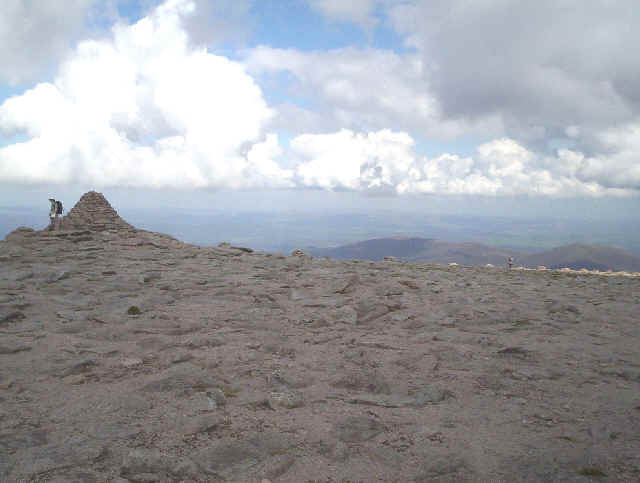 The walk is long but not in the least difficult in good conditions.